The wonder of a snowmobile safari is that you can go out in to the wilderness and find areas untouched by roads and habitation. There are thousands of miles of snowmobile tracks in Lapland giving you the opportunity to find the best views, the amazing shapes of snow frozen on the trees and the beautiful pale colours of the open skies. It is an Arctic Adventure of a lifetime to find the unspoilt, sunning scenery for which Lapland is justifiably well known. A snowmobile is a machine designed to be driven on snow or ice without the use of a road. 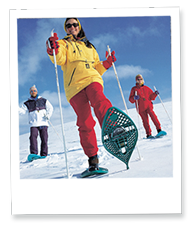 Designs vary as some models are more suitable for deep snow and forests but most are used on open terrain including frozen lakes and paths or trails. They were originally intended as a winter utility vehicle to go where other transport couldn’t go and were used by hunters and workers transporting people and materials across the snow covered land. Now they are used more for recreation and getting out in to the wilderness of Lapland. 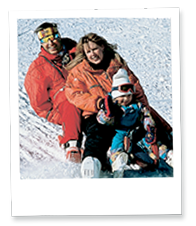 The design has evolved so that most snowmobiles carry two people (driver and pillion passenger) with windshields and leg protectors and even warmers on the handlebars. Helmets are supplied and the driver must have a full driving licence. There are very strong rules with snowmobiles and safety, consumption of alcohol is completely forbidden and there are dedicated snowmobile trails with ‘Give Way’ signs just as on a road. 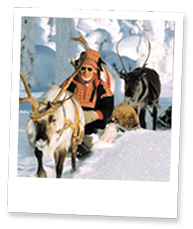 Children who are not large enough to travel as a pillion passenger all travel together in a sleigh pulled by the guide’s snowmobile. One guide will lead the group who follow in order. It doesn’t mean that the group drive like ‘Sunday Drivers’ and there is speed and times when you can open the throttle but safety is a priority on these safaris especially as many people have not driven them before.